Can you remember some famous chemical symbols from the element`s name. On you go give it a try. As always my annual Christmas poster competition is what a scientist would like for a gift on Christmas morning. There were some fantastic entries. Christopher`s science lab bike caught the judges imagination. Congratulations Christopher! Pick up your prize in the new year. Runner Up was Patrick Goodfellow 1.5 for his binocular contact lenses. Geat for stargazing. Congratulations Patrick. Consolation prizes judged to be great ideas were Morgan McConville`s flying shoes. Anthony Hamilton`s amazing IEA machine which does everything and I mean everything! Congratulations. A Happy Christmas from Mr Mallon. Just as promised click on the link below to download a cracking looking periodic table. Can you find how many elements naturally occur as liquids? Build your Electric Circuits Activity. 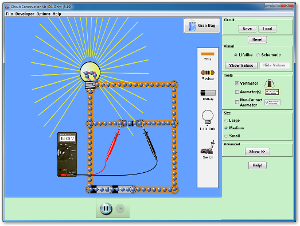 Here is a cracking activity that lets you build your own circuits on your computer. Comments Off on Build your Electric Circuits Activity. Flying through space looking down on our planet. A super time lapse film of the International Space Station as it flies over the planet. Look out for the aurora. These are the green bands on the edge of the Earth. You can also see lightning storms and big cities lit up at night. What a joy to see. Comments Off on Flying through space looking down on our planet. Use this Google Flash Card game to remember the key words we studied in the Biodiversity topic. Then press Hide All and then press Shuffle. Now copy the words onto a piece of paper and write down the meaning. Have some fun learning the meaning of these words. Use the key written below the biologist`s notebook to help him find the name of the birds in his book. Beak curved upwards: It is an avocet. Find out what the word biodiversity means.